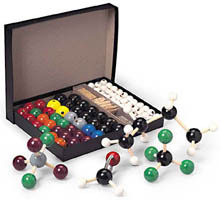 This week you’ll be playing with your molecular modeling kits and working on a 12-page packet. The topics covered in your packet are discussed in chapters 3 and 7 of Carey (7th ed. ), and you will learn them again in lecture sometime before the mid-term. Here are my comments on some of the harder (or more confusing) parts of the packet. The topic of cyclohexane alone will take up 2-3 organic chemistry class periods, so don’t feel overwhelmed if you don’t understand it all in one lab period. When cyclohexane is drawn as a Lewis structure it is drawn as a hexagon. But in real three-dimensional space it takes the form of a “chair” (shown below). The chair form of cyclohexane is the most stable conformer because each of the bond angles measure exactly 109.5º- the same bond angle of a tetrahedral sp3 carbon. No bonds have to bend in order to fit into shape, so there is no ring strain. You arbitrarily assign wedges to mean “up” and dashes to mean “down”. (Wedges represent bonds coming out of the page, dashes bonds going into the page). Notice that what was “up” in the overhead view is also “up” in the chair form, but that the axial and equatorial ups (and downs) alternate: if the up substituent on carbon-1 is axial, the up substituent on carbon-2 is equatorial, and the up on carbon-3 axial, an so on. If substituents are all facing the same direction they are cis, if not, they are trans. Cis and trans have nothing to do with axial and equatorial, only with up and down! You’re probably thinking “OK, I know how to tell what’s up and down, but how do I tell what’s axial and equatorial?” Well- that’s up to you! Rings do a chair flip- if you rotate all the bonds in a chair form, all the axials become equatorials and vice-versa, but up stays up and down stays down! Because up stays up and down stays down, cis/trans relationships are unaffected by chair flip. One last thing to notice with chair flip is that the position of the carbons change a little bit- you move every carbon over one. In the picture above, carbon-1 went from the upper right corner to the lower right corner, and carbon-2 followed. You do this with chair flips. 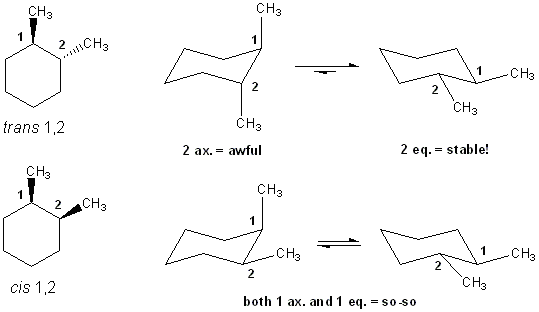 One last (but important) point about cyclohexane is that substituents don’t like to be in the axial position. Doing so causes them to bump into other axial substituents, causing steric strain. This is called a 1,3-diaxial interaction. No such problems exist for equatorial substituents. So when you choose between a pair of chair forms, choose the one with the more (or largest) substituents in the equatorial position- this chair form will be the preferred conformation. This is a common question and you should expect to see it again on an exam. 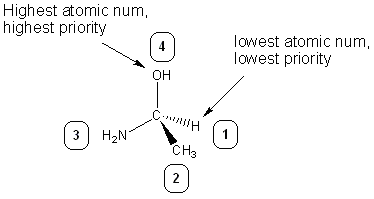 You are asked to compare the relative stabilities of cis and trans 1,2-dimethylcyclohexane. What you will find is that the trans isomer can avoid having any axial substituents, but cis is always forced to have one methyl group axial. Because of this, trans 1,2-cyclohexane will be lower energy/more stable than cis. Using this form of analysis you should be able to answer related questions: • Which compound is more stable: cis or trans 1,3-dimethylcyclohexane? • What about cis and trans 1,4-dimethylcyclohexane? You can use your model kits to make cis-cyclohexene. But you would probably break the plastic if you tried to make the trans isomer. This is because the ring is small enough that the bond angles required for trans are impossible: trans-cyclohexane would be too strained to exist. But you could have trans cycloalkenes if you have more carbons. This is because adding more CH2’s gives your ring more “slack”. This is another topic that will take 2-3 lectures to cover, so there’s no shame if you’re not 100% with it after only one lab period. 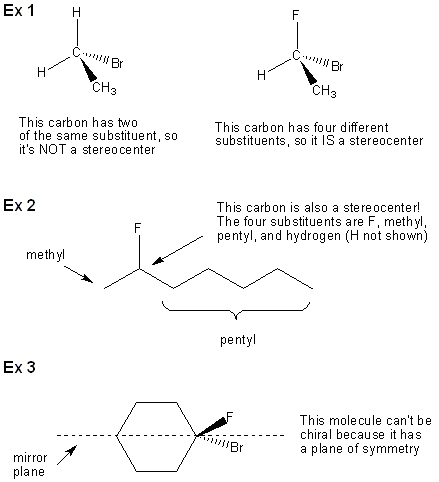 Stereochemistry is covered in chapter 7 of Carey. Something is chiral if its mirror image is non-superimposable. For example, your hands are mirror images of each other, but no matter how hard you try you will never be able to place a right hand over a left hand with perfect overlap. So your hands are chiral. The word for a non-superimposable mirror image is enantiomer. Your left hand is the enantiomer of your right hand. Molecules can be chiral too. In question#9 (page 10/12) you construct CHFClBr and its mirror image, which are enantiomers of each other. 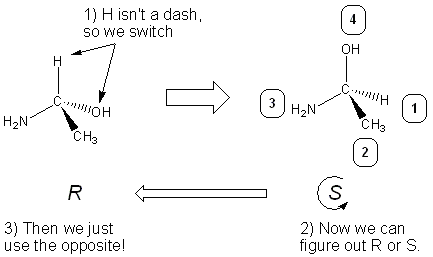 Here’s how to tell if a molecule is chiral: • If a carbon has four different substituents than that carbon is a stereocenter. • Molecules with a stereocenter and without a plane of symmetry are chiral. Let’s take a look at some examples to see what’s going on (see the diagram on the next page). The last topic covered in the packet is assigning R/S configuration. To do this, first you assign priorities to each substituent. Priorities are based on atomic number- the higher the atomic number, the higher the priority. The lab packet (and this guide) uses 4 as the highest priority and 1 as the lowest (your textbook uses the opposite numbering system, but worry about that later). 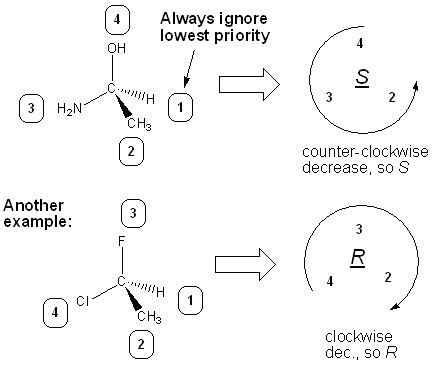 After priorities are assigned, you see which way the priorities decrease: • If they decrease in a clockwise (CW) fashion, the stereocenter is R • If they decrease in a counter-clockwise (CCW) fashion, the stereocenter is S Note that this only works if the lowest priority substituent (usually hydrogen) is going out of the page (a dash).